A Timeless Tribute to the Man Who Started it All. 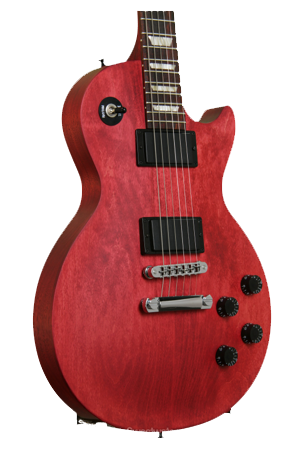 As part of the 2013 Year of Les Paul celebrations, Gibson USA brings you a new Les Paul model that's available at an entry-level price to suit any budget. The LPJ offers all the ingredients that made the most desirable Les Paul Standards legendary- classic tonewoods, innovative hardware, two genuine humbucking pickups, and of course Gibson's acclaimed build quality and playability- all wrapped up in a stripped-down, no-nonsense package that makes this guitar a flat-out performer. Simpler aesthetics and a cool worn-look finish technique add up to big savings for the player, and the LPJ still looks great in your choice of Cherry, Chocolate, Hand-Rubbed Vintage Burst, Hand-Rubbed Transparent White, or, for an extra charge, Goldtop with Brown Satin Back, all in grain-textured nitrocellulose lacquer.